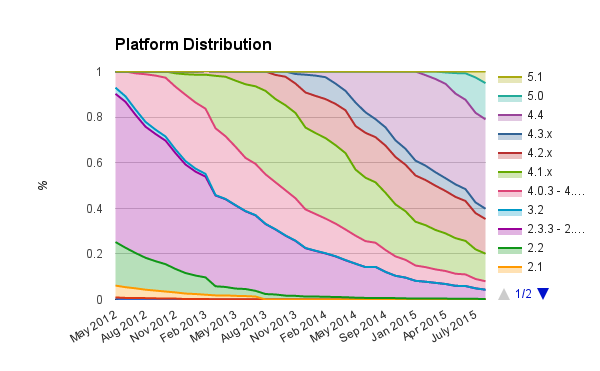 android version database distribution platform Stats How's the split between Android versions? How's the split between Android versions? Ooh, the giddy little numbers geek in me is liking this time of the month. Android pushes out their latest version distribution. I then, in turn, feed it into my little database which shows me how each of the versions are growing/shrinking. Even better, Google Sheets now will come up with its own interpretation with Explore (doesn't really have a lot yet). So, how are the numbers looking? Data collected during a 7-day period ending on September 7, 2015. Froyo is just hanging in there (my poor friend using my old HTC Magic... just on the outskirts by himself). Lollipop is now in more than 1 out of every 5 users, KitKat is 2 out of 5. Not bad. Remember, I keep track of the data on my database page so you can look at all the historical information!